Anatomy offers up over eight-hundred of some of the most unique and uniquely playable instruments that twist and transform the human body into one expansive collection of physiological melody and rhythm. Anatomy sonically explores the human condition in ways never dared attempted previously, delivering you a deep, diverse & rich new palette of sonic colors and textures. Facilitating the exploration and navigation through the mysterious marvel that is Anatomy, all 856 instruments included are separated into the following two categories. Man: The organic perspective. Hundreds of leads, pads, kits and effects that encompass the full sonic terrain and delicate inflection the human body can muster. Simply presented but expertly enhanced with real-time controllers for additional manipulation. Singing and screaming. Snoring and roaring. Machine: Lovingly effected and manipulated interpretations of the human condition as it might be perceived through the binary brain cells of a bloodless future race. Agitated androids. Slumbering cyborgs who dream of electric sheep. Cinemascapes of hallucinatory terror and funhouse anxiety. Transform. Transmogrify. Transmit. 432 Angelic to eerie, abrasive to absurd, beautiful to booming presets of pads and leads, all lovingly constructed to give you complete control of these dynamic & different instruments. Throat singing to humming, whistling and much much more. The definitive collection of vocal beat box percussion. 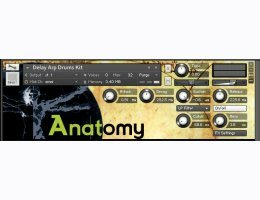 Over 200 unique kit presets with a massive tool box of additional kicks and snares for even more flexibility. We laid down a staggering array of sound that the SONiVOX design team edited and programmed into intuitively playable patches that are sure to suit every type of music from rock and hip hop to acid jazz and electro funk. Even better, Anatomy's kits are GM compliant making them easily droppable into existing sequences. 26 kits of Snaps, claps, foot stomps, and heartbeats. Imagine the heart as the rhythm section and ultimate timekeeper. 138 Presets from the ordinary to the extraordinarily strange. Blips, burps, gurgles, growls, groans, and nostril snorts. Laughing, moaning, and simulated emotional breakdowns. Plenty to satisfy ones appetite for the bizarre and unusual. 29 Presets that equip you with a complement of male and female choirs and choral groups with a variety of articulations and programming variations. Ethereal voices and intimate utterings.